Reflections of a traveller: Do we Muslims really need Valentine's Day to show our love? Do we Muslims really need Valentine's Day to show our love? Subhanallah so many Muslims (?) are now celebrating the Valentine's Day. Seeing friends on FB sharing their ‘Valentine’ wishes makes me quite confused. What’s going on? Are we really allowed to celebrate this day? Why do we need this one day to show our love and affection to our loved one? Our beloved Messenger Muhammad (SAW) showed love and affection to his wives every single day of his life through his beautiful action. He (SAW) never treated them with harshness and always been very kind and gentle to the mothers of believers. Even the companions (RAW) were so good to their wives mashallah. Our faith teaches us to love and show respect to people who are very close to us every single day of our life, not just this one day! Life is just a moment for us so we are told to make it a moment of loving Allah swt and His beautiful creation insha-Allah. If we know the origin of Valentine day, I don’t think as Muslims we would like to celebrate this day anymore. It’s due to utter ignorance that most of us are getting swept by the culture of the majority of people who love to celebrate this occasion. The origin of this day, known as ‘Valentine day’ or ‘Festival of love’ is based on festivals celebrated by pagan Romans, when paganism was the prevalent religion of the Romans more than seventeen centuries ago. For them it was an expression of spiritual love. The Romans used to celebrate this event in mid-February each year with a big festival. So what was the connection between Saint Valentine and this festival? Saint Valentine is a name which is given to two of the ancient "martyrs" of the Christian Church. When the Romans embraced Christianity, they continued to celebrate the Feast of Love mentioned above, but they changed it from the pagan concept of "spiritual love" to another concept known as the "martyrs of love", represented by Saint Valentine who had advocated love and peace, for which cause he was martyred, according to their claims. It was also called the Feast of Lovers and Saint Valentine was considered to be the patron saint of lovers. One of their false beliefs connected with this festival was that the names of girls who had reached marriageable age would be written on small rolls of paper and placed in a dish on a table. Then the young men who wanted to get married would be called and each of them would pick a piece of paper. He would put himself at the service of the girl whose name he had drawn for one year, so that they could find out about one another. Then they would get married, or they would repeat the same process again on the day of the festival in the following year. The Christian clergy reacted against this tradition, which they considered to have a corrupting influence on the morals of young men and women. It was abolished in Italy, where it had been well-known, then it was revived in the eighteenth and nineteenth centuries, when in some western countries there appeared shops which sold small books called “Valentine’s books”, which contained love poems etc. “There are forms of expressing love that are religiously acceptable, while there are others that are not religiously acceptable. Among the forms of love that are religiously acceptable are those that include the love for Prophets and Messengers. It stands to reason that the love for Allah swt, and His Messenger Muhammad (peace and blessings be upon him) should have the top priority over all other forms of love. Islam does recognize happy occasions that bring people closer to one another and add spice to their lives. 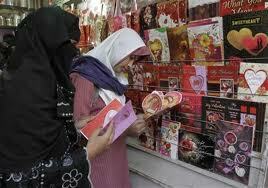 However, Islam goes against blindly imitating the West regarding a special occasion such as Valentine’s Day. Hence, commemorating that special day known as the Valentine’s Day is an innovation or bid`ah that has no religious backing. Every innovation of that kind is rejected, as far as Islam is concerned. Islam requires all Muslims to love one another all over the whole year, and reducing the whole year to a single day is totally rejected. There is a short talk done by Shaykh Abdullah Hakim Quick on the history of Valentine's day. There is also quite an emotinal talk done by a shaykh in Middle East. May Allah swt reward these people who are trying to educate and enlighten Muslims , alhamdulillah.